I reckon if a snake tried to take on of those Cape Town city-dwelling pigeons, I’d back the bird. Seriously, some of them look like they’ve survived exclusively on a diet of accidentally dropped tik, and they’re hardly bothered about getting out of the way of pedestrians or cars. Over in London, the pigeons are probably used to being hand-fed by caring pensioners, so this chap never stood a chance. 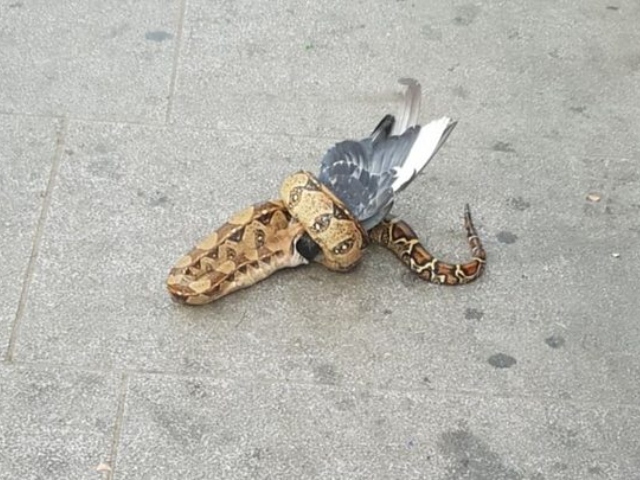 A boa constrictor has been seen eating a pigeon in a busy street in east London. The tropical snake, which it is thought may be an abandoned pet, caused screams from passers by after it was spotted by passers by. It was rescued by the RSPCA and it is currently being assessed at a wildlife centre. A spokesman said that it appeared that someone had found a dead pigeon and fed it to the snake. 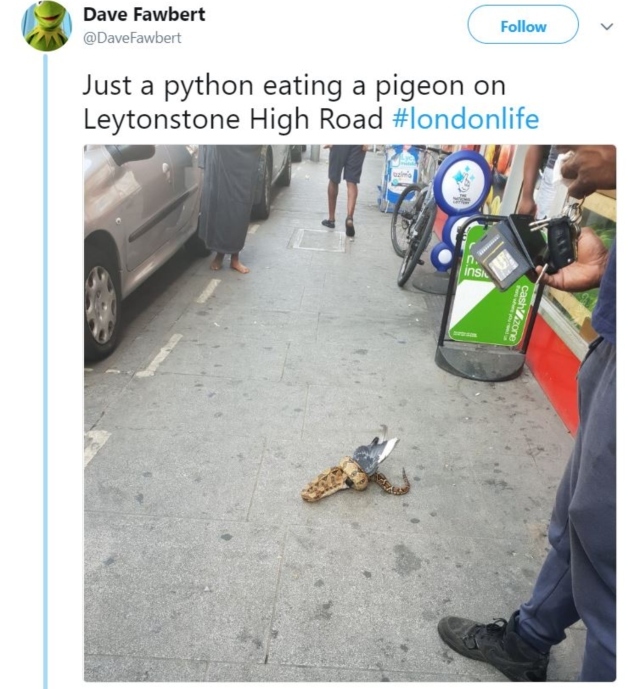 Dave Fawbert spotted the snake, which he believed at the time to be a python, whilst walking home from the bakers along Leytonstone High Road on Saturday. Snakes are just like dogs and cats, people. If you get one, make sure you intend to keep it for as long as it lives. The charity [RSPCA] said that it is encountering widespread neglect of reptiles as many people are unaware of how much of a commitment these animals are when they take them on. As a result they now rescue hundreds each year. You moved into a new flat and they don’t allow pets? Tough cookies, you signed up for the long haul.